Most fascinating of all though for me were the wonderful samples of her felt work that Joanna shared with the group. 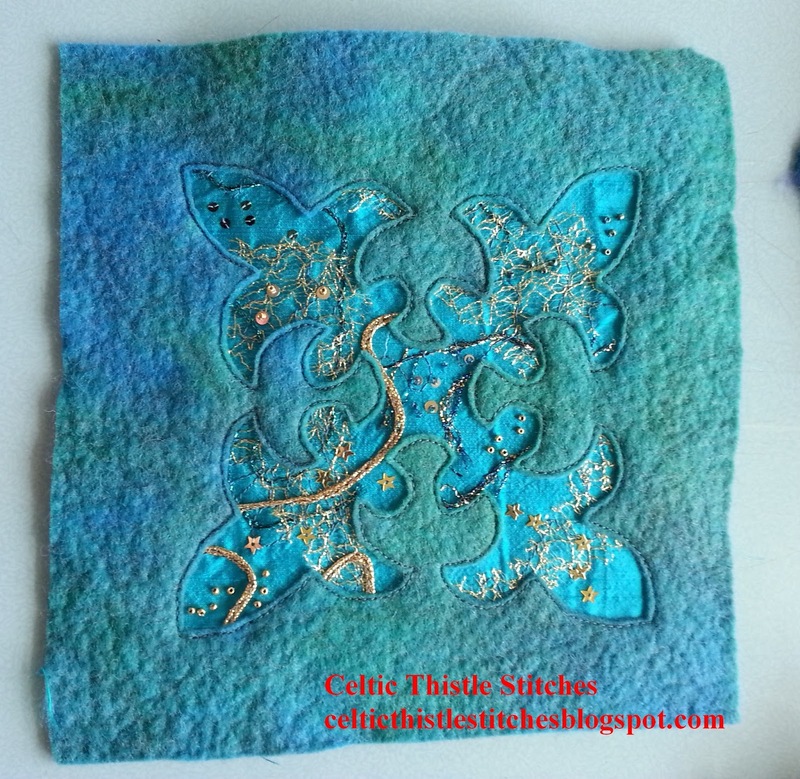 This reverse applique piece was probably my favourite, isn't it beautiful? I loved the colours in this one too. 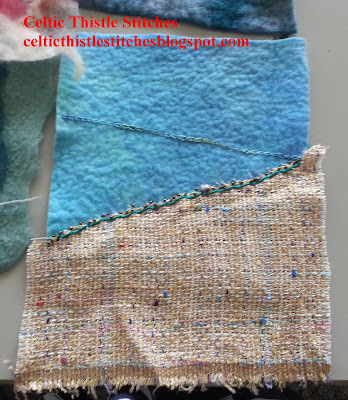 Joanna's samples demonstrated the many different methods that she used to create her felt and you can see the difference in the density of the two pieces above, which was due to the length of time taken over the felting process and the nature of the original material. 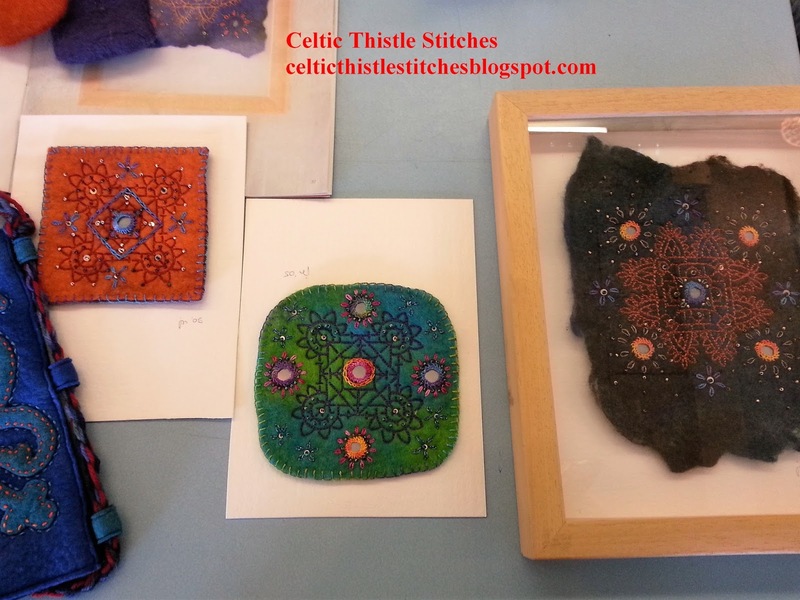 As well as embellishing the felted material with embroidery as shown above, Joanna also uses Shisha mirrors to embellish her work. This piece was much admired by everyone present, although the other pieces shown below were just as delightful. 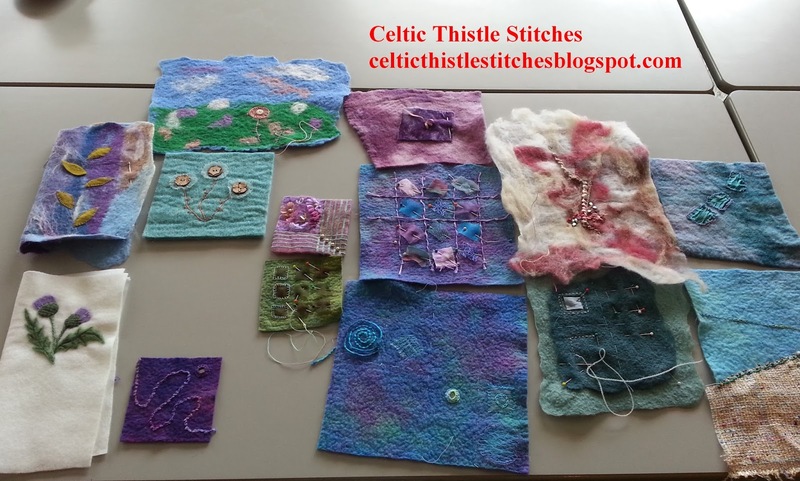 Naturally this being an Embroiderers Guild workshop we were given the chance to have a go at creating something similar ourselves! The small purple square in the bottom left hand corner was created by a friend who was struggling to come up with a concept for her piece, then we remembered the recent death of Prince and his hit song "Purple Rain" and realised that she had her concept! 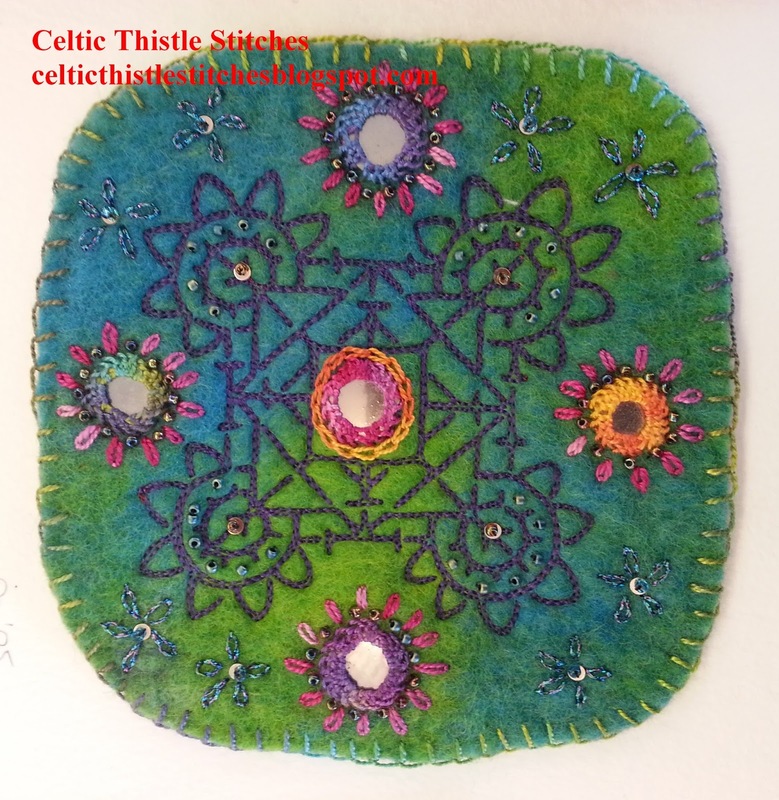 We had been told to bring along scraps of fabric, ribbon and threads as well as our squares of felt, so my attempt to emulate Joanna incorporated a scrap of tweed-like fabric brought back from Latvia, as well as beads and embroidery. As you can see I didn't get very far on the day, but eventually this piece will represent a seascape taken from our holiday on the west coast of Ireland. I am not accepting any bets though on when eventually will be! 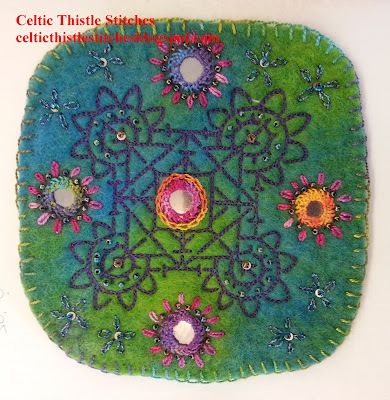 what an amazing felter wonder if it is all done by hand or if she uses a felting machine, must get mine out and have a play after seeing these pieces. 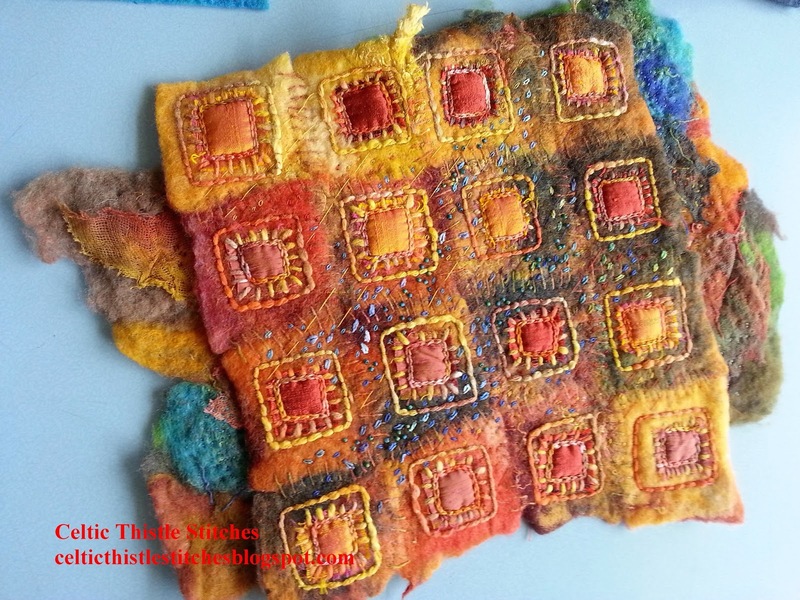 Stunning felt work, Fiona. It would have been wonderful to see first hand. Have fun finishing your sea scape. Oooh, what fun! Love working with felt!